NEW YORK CITY — Forty-eight people were fatally struck by subways in 2016, marking the lowest year-end total in five years, according to the MTA. The 2016 dip is 10 fewer than the five-year high in 2014 and is due in part to the authority's awareness campaign — including one involving Pokémon Go — urging riders to be more careful, according to MTA spokesman Kevin Ortiz. "We have various public information campaigns warning customers to stay away from platform edges and I think customers are heeding that warning," Ortiz said. "You should stand at least 3 feet back. I just don't want to stand too close. From here, I can still see whether the train is coming," said Leshell Wills, 43. Fewer people overall were hit in 2016 with 168 incidents, down four from the previous year, Ortiz said. That includes high-profile cases like that of Connie Watton, who police said was shoved in front of a 1 train in Times Square by Melanie Liverpool-Turner. Liverpool-Turner is due back in court for that case in February and has confessed to, but never charged with, pushing a German student to her death in Union Square. 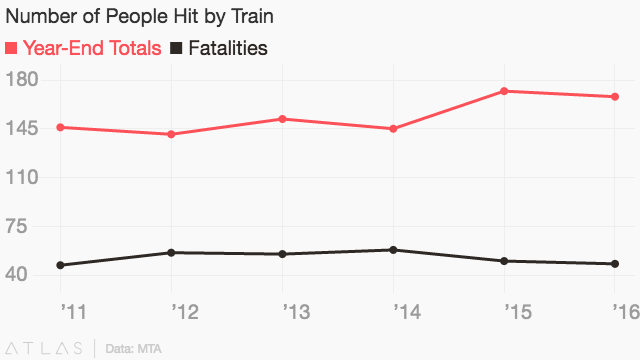 Incidents like that have also driven people away from platform edges. "I usually stand way behind the yellow. You just hear of people pushing people, stuff like that. You never know, so just follow the rules and stay behind the line," said Corey Williams, 35. "I have no clue why someone would want to stand that close. Anything could happen. Occasionally, I'll look to see whether the train is coming, but it's a quick glance," Williams added. The MTA breaks train strike incidents into six categories: people who were hit outside of a subway station (like in a tunnel), those hit in stations but not on a platform, hits on the platform, alleged suicides, attempted suicides and people who fell between subway cars. Similarly, while 2016 marked the lowest number of fatalities, the decrease hasn't been dramatic. The MTA plans on testing platform doors, similar to those seen on AirTrain, that would separate people from the trains hurtling along the tracks. It's slated to be tested at the L train's Sixth Avenue station at West 14th Street, though MTA officials said in February 2016 that its location could change. If the MTA adopts the screen doors, it's still unclear where else they'd be used. MTA officials have said in the past that installing them would be "prohibitively" expensive. With reporting by Trevor Kapp.